Argentine ants rank highly as a domestic nuisance species. The majority of the human population (>66%) in New Zealand is within the potential range in which Argentine ants could establish (Ward 2009). Thus, the potential for interaction with humans is high. Furthermore, interactions will only increase as Argentine ants continue to spread throughout New Zealand. Although it has taken some time before public enquiries and complaints have appeared, since 2005 there has been a dramatic increase in public correspondence regarding Argentine ants (L. Vaughan pers. comm., D. Watchman pers. comm.). The scope of these interactions has not been quantified, but there are numerous anecdotal reports. In the summer months, a significant amount of council (e.g. in Northland and Bay of Plenty) staff time has been taken up with enquiries and complaints about Argentine ants . Social impacts that have been noted by council staff, pest controllers and scientists in New Zealand include: (i) Argentine ants being an extreme domestic nuisance pest within houses, getting into cupboards, sealed jars, electrical areas, behind walls, and beds; and (ii) people being unable to garden, hold social events, or let their children play in household backyards because of aggressive swarming and in some cases being bitten. We are also aware of people selling their houses and moving away from the infested area (Nelson, Coromandel), and pets (lizards, birds) kept in cages being killed (Bay of Plenty, Northland). There are generally two main economic impacts associated with Argentine ants: (i) increased costs associated with treatment, and (ii) productivity losses in the horticultural sector. Economic impacts have been estimated through a basic assessment of potential treatment expenditure for Argentine ants in New Zealand across household, business, urban space and conservation sectors (Ministry of Agriculture and Forestry 2002). Full annual treatment expenditure once Argentine ants have established throughout their predicted New Zealand range was estimated to be $68 million (2002 dollars). However, given the slow spread of this species, it is likely to be some time before annual treatment reaches this level (2002/03 estimates $0.6 million, and 2009/10 estimates $1 million). Households account for the bulk of treatment costs (88%), with businesses/industry at 11%. The North Island has 93% of treatment costs because of the larger human population and more favourable climate. Households in the upper North Island account for 50% of treatment costs. Trade restrictions as a result of contamination of exports to countries that do not currently have Argentine ants, e.g. China, and Korea (Davis & Van Schagen 1993). Risk of disease transmission increases, as sap-sucking insect populations disperse from one plant to another, and/or from one orchard to another (El-Hamalawi & Menge 1996). Argentine ants either exclude or act as predators towards other insects; this leads to a reduction in beneficial insects such as predators and parasitoids that are reducing pest insects in orchards. The feeding actions of large numbers of sap-sucking insects reduces the quality and/or yield of crops. Disruption of the performance or establishment of biological control agents. Recent research in New Zealand shows Argentine ants (and other exotic parasitoids) reduce the numbers and establishment of the boneseed leaf roller, Tortrix sp. ‘chrysanthemoides', an agent introduced into New Zealand for control of boneseed. Overseas, Argentine ants can have a significant impact on the horticulture industry (particularly citrus, Davis & Van Schagen 1993; grapes, Vega & Rust 2001), and through the destruction of beehives and irrigation systems. In New Zealand, Argentine ants occur on a wide variety of plants including common horticultural crops (pipfruits: apple, pear; citrus: orange, mandarin, grapefruit, lemon; grapes; kiwifruit; stonefruit: peach, plum, nectarine, cherry; and others: avocado, olive, feijoa, persimmon, tamarillo, passionfruit) as surveyed by Lester et al. (2003). However, to date there is little information on Argentine ants affecting horticultural crops in New Zealand, and no quantification of economic losses, either realised or potential. Similarly although the potential exists for impacts on the beekeeping industry there have been no such reports in New Zealand to our knowledge. Harris et al. (2002) examined the vulnerability of native habitats in New Zealand to the invasion by Argentine ants through a combination of large-scale surveys, across Northland and Auckland, and by measuring the extent of their invasion into different native habitats at several locations (also Ward & Harris 2005). Harris et al. (2002) proposed that ‘open canopy habitats’ (e.g. mangrove, scrub, urban restoration, coastal forest) are most vulnerable to invasion by Argentine ants, and that closed-canopy forest was unlikely to be suitable (confirmed by Silverman & Brightwell (2008)). In terms of their impacts on biodiversity, the primary effect of Argentine ants is the displacement of native ant species (Holway et al. 2002; Sanders et al. 2003; Rowles & O’Dowd 2007). New Zealand has a very small native ant fauna, which primarily live in forest habitats, thus Argentine ants are much less likely to affect native ant species. The general conclusion from impact studies is that when the total ant biomass is increased following the invasion of Argentine ants, the invertebrate community is negatively affected (Cole et al. 1992; Human & Gordon 1997). Detrimental impacts of Argentine ant invasion are documented from sites in Hawai'i and California (Cole et al. 1992; Human & Gordon 1997; Bolger et al. 2000). In all these studies the invertebrate fauna was more abundant and diverse without Argentine ants. Many groups of invertebrates were entirely absent or rare in the presence of Argentine ants. Recent research in New Zealand indicates that Argentine ants affect litter decomposition (M. Stanley & D. Ward unpubl. data). At invaded sites: (i) invertebrate composition differed significantly (in particular, a significant reduction in the abundance of landhoppers (amphipods)); (ii) microbial biomass is lower (indicating that fungal and microbial decomposer communities have been altered with invasion); ( iii) the fibre content of leaf litter was higher and key nutrients lower, (indicating slower decomposition at invaded sites). 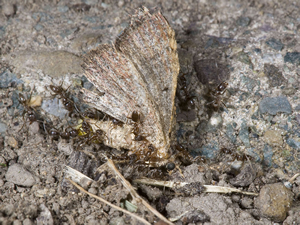 Together, the results suggest that Argentine ants displace landhoppers, consequently removing a major functional group from the habitat, resulting in less shredded litter for colonisation by microbes and other invertebrates, and slower breakdown of leaf litter (less decomposition) at invaded sites. Ants are considered poor pollinators, so a reduction in other pollinators is likely to be detrimental to flowering plants. Buys (1987) demonstrated that Argentine ants collected large amounts of nectar from Eucalyptus spp. before native bees began foraging. Visser et al. (1996) found that the abundance and richness of pollinators on Protea were reduced when there were more than 200 Argentine ants per infested inflorescence. They can also disrupt dispersal of seeds by native ants, resulting, for example, in lower survival of seeds after fire in the South African fynbos (Bond & Slingsby 1984; Giliomee 1986). In New Zealand, Argentine ants can often be found on native flax plants. Results show their presence reduces pollination and there are smaller seed sizes compared with uninvaded plants. Small seed size may affect germination of seeds (M. Stanley unpubl. data). Argentine ants feed extensively on honeydew produced by sap-sucking insects. This may increase the abundance of sap-sucking insects in native habitats (affecting the growth of native plants) and the risk of disease transmission between plants. Direct impacts on vertebrates are also possible. Newell and Barber (1913 in Wetterer 1998) described Argentine ants attacking and killing nesting birds: 'workers swarm over young chicks in such numbers as to cause their death'. Competition for food is also highly likely and may cause the decline of some species (e.g. Suarez et al. 2000).